Pulmonary Hypertension Was No Problem for This Two Year Old with Down Syndrome! Yes. He has an older sister and an older brother. We had a postnatal diagnosis. We had concerns about his breathing shortly after birth. The NICU team came down and determined he just had some fluid that he had to work out. After the paediatrician did her checks, she informed us that he had Down syndrome, and would verify with a blood test the next morning. She sent the genetics team in to meet with us and give us the results. The nurse heard a heart murmur, and he was taken to the NICU for further testing. The nurse brought him in before they moved him, without permission from the paediatrician. He was in the NICU for 15 days for Pulmonary Hypertension. His weight fluctuated as well. 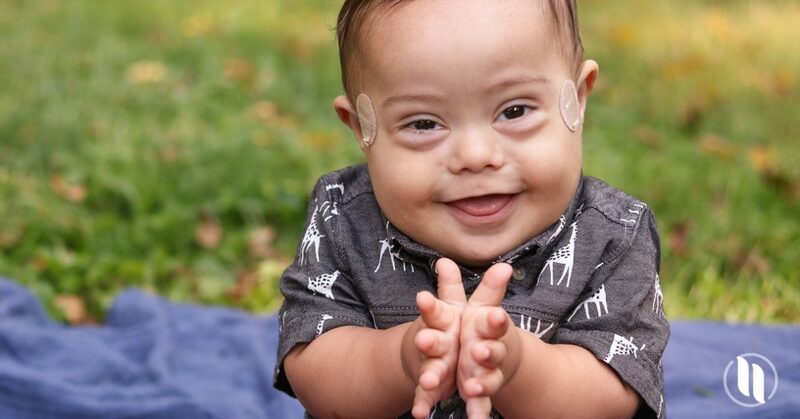 The cardiologist determined he had a couple holes in his heart and a cleft valve – which would eventually require surgery. He was a planned/repeat C-Section, one day prior to due date. He was a whole 10 pounds, 1 ounce! After our NICU stay, it was a little nerve-racking. Even though he was my 3rd child, every little imperfection terrified me (even spit up). After many, many doctor appointments and specialist visits, I began to calm down. I didn’t have to remain on high alert for every little thing; he was going to be just perfect. Emerson has developed fairly well. He is slightly behind his peers, but not too far. There were even a couple milestones that he did prior to my other children doing! It has been a lot of hard work, but well worth it. He is now running around chasing and cheering on his siblings. To be honest, it doesn’t seem like he takes extremely long to meet milestones. It could just be because he is my baby-and who really wants them to grow up quickly?? My whole outlook on life has changed. I used to be a Type A person, super organized, very detail oriented, and a little high strung. He has taught me to slow down and to enjoy the little things. Life is not going to go how you want it to, just because you plan for it to. He has brought an understanding and compassion to me about people with disabilities. Any notion of anything that I ever had about a person with Down syndrome has changed. I see them for who they are. And I am now advocating and informing others of all the things that they are possible of accomplishing. As a family, we enjoy swimming in our pool; we like to goof off and have a good time, and we like to go to the park and enjoy nature. The amount of visits in the beginning, and maintaining a good schedule. I was also not educated in people with disabilities and their world. It will be okay. You will change for the better. Your life will have a better purpose. You will think that he is one of the most amazing people in your life. This is still your child. There is nothing that they cannot accomplish, but it may take a little more time. Each accomplishment is a celebration! Your baby will give the most love unconditionally. They are sneaky! Do not underestimate them!